sense of humor, really cared about the things we want in the house and really want to ﬁnd the perfect home for the two of us.” The episode focused on the conﬂicts between the couple when searching for a home that ﬁt both of their needs. Alli wanted an open-concept home while Josh wanted a vintage house with a big yard. Another conﬂict they faced was the counters; at one point in the episode Josh says a counter looks like it was made for a 13-year-old girl and then calls Alli a 13-year-old girl for liking it. The couple ﬁlmed for ﬁve 12-hour days, exploring three different houses and ending with their decision to buy a 1918 home renovated in the 1990s. “The last house we toured was the house out in the country,” Josh said. “That one was the most stressful because there was a huge storm the night before and the power got knocked out, so we got there and we had to sit around for the power to get back on.” Josh said he wouldn’t recommend buying a home through House Hunters. “It was really fun, but I think if I didn’t work in TV before, I wouldn’t know what I was getting into,” Josh said. “I don’t think people realize how stressful and how much hard work it is. You don’t just show up and ﬁlm, it’s difﬁcult.” Since buying the house, the couple have painted every room, worked on landscaping outside the house and reﬁnished all of the hardwood ﬂoors upstairs. Banfield, McDonald for Students won the Oshkosh Student Association election for president and vice president positions with 411 votes. Candidates were notified of the results on March 19, although the results were not official until the OSA body approved the election report this Tuesday. Coming in second place with 364 votes for president and vice presidency were Alicia Obermeier and Hannah Johnson. to make all students feel welcome here regardless of who they are and where they come from.” OSA vice president Ian McDonald said they are honored to accept their new positions within OSA. “When we found out that we won, we were very humbled to know we have the opportunity to serve our campus,” McDonald said. “There’s a lot of issues on our plate for our administration, and ever since we won, we’ve been strategizing on how to maximize our productivity and effectiveness in office.” The new positions will take effect at the beginning of the fall 2019 semester. CHRISTINE ROTH demotions.” Prior to the oral hearing, Roth’s attorney, Peter Culp, argued 10 speciﬁc policy interests that he said override the public’s interest in disclosure, including that the records may contain information about the employment, performance evaluation and or potential discipline of one or more public employees. At that time, Culp also argued if the documents were disclosed to the public, it would likely have a substantial adverse effect upon Roth’s reputation. A tickler review date is scheduled for May 1, 2019 at 8 a.m.
ic growth in Wisconsin and across the country,” Baldwin said. “This legislation will help bring relief to Wisconsin students and families by ensuring they can refinance their loans and pursue a repayment plan that works for them.” Assistant Director of the UW Oshkosh Financial Aid Office Karen Kennedy said not everyone is eligible to refinance under the act, and some people may not want to. “I don’t really have any feelings about it because you have to be careful as a consumer,” Kennedy said. “If you refinance at a lower interest rate, that might be better for you, but you may lose some of the borrow benefits.” Kennedy said it’s complicated because the department of education has other programs for people that can’t pay their full payments. ABOVE: UW Oshkosh RTF students pose with their WBA awards. Front row pictured left to right: Matilda Cretens, Taylor Mueller, Chris Bjornstal, Cora Seibt, Billy Piotrowski and Jolee Mallman. Back row pictured left to right: Justine Stokes, Brandon Fuller, Crystal Perez, Shiloh DeBauch and Cody Barnes. important, unbelievably depressing,” Cannon said. “We wanted to do something in the spring that took a whole different, very positive focus.” Transgender Day of Remembrance is a day dedicated to memorialize those who have been murdered as a result of transphobia. The theme for the TransAction conference on Saturday “We Unite: Trans Rights and Self-Advocacy.” Registration for the conference can be found on the LGBTQ+ Resource Center events page. Cannon said that the TransAction conference is geared toward transgender and nonbinary individuals, but strong allies are more than welcome to attend. “We have people coming from Milwaukee, Green Bay, Stevens Point and Racine to get together and to talk about issues of resiliency, self advocacy and various areas that are affecting their lives,” Cannon said. make more people eligible. That would drastically cut loan debt. So if you don’t have to borrow so much to go to school, that’s a better thing.” According to estimates from the Department of Education, about 25 million borrowers would be likely to reﬁnance under this legislation, and borrowers would receive an average savings of $2,000 over the life of their loan. Michael Godfrey, a UW Oshkosh supply chain management professor, was incorrectly listed as one of six College of Business employees to make the Top 10 of those receiving overload pay for the UW System in 2017-18. The sixth UWO COB employee should have been Assistant Dean Dale Feinauer. The six made $245,560 in overload pay, ranging from $39,555 to $42,508 each. Godfrey, who told a student reporter that he did not want to comment on the story, was actually 11th on the System list and seventh on the UWO list. The Advance-Titan regrets the error. Lettuce grown hydroponically on campus Jericho Road Industries partnered with UWO to provide a method of growing plants without the use of soil in a unit under the stairs at Polk Library. I get them enrolled in the course and make sure that goes well,” Crawford said. “I also interface any time I’m needed with Jericho Road and with campus people to make sure everything’s working.” Crawford said Jericho Road organized this initiative. “I was approached by Abigail from Jericho Road, and she was actually looking for a way to get more student volunteers to help her with the grow machines, and I suggested it might be better to have it here so it’s easier for students to get to,” Crawford said. Crawford said students can earn credit for growing the lettuce. “It’s a University-wide project, and we expect that any time there’s lettuce growing in the unit, we’re going to have a student getting course credit for either an internship or independent study,” Crawford said. “Elijah, the student that’s running it right now, he’ll be in charge of it for the semester.” Jericho Road Ministries Lutheran Food Pantry special projects manager Abigail Miedaner said she started working with the machines last year. has been a disconnect in that food pantries can’t provide healthy food even though we know that we want to do that, so this ties in really well with the initiative to provide healthy food for people coming to food pantries.” Miedaner said helping clients with healthy eating can benefit other aspects of their lives. “It is supplemental; it’s not meant to be their sole source of food. But in providing that supplemental food, if we can get it to last longer and to be higher quality, that’s going to help their health which, in turn, can help a lot of other things too,” Miedaner said. Miedaner said this is the food pantry’s way of sharing their faith in the community. “We’re passionate about sharing Jesus’ love for people,” Miedaner said. “So I think it’s just fantastic that we have a tangible way that we can show Jesus’ love by providing something fresh.” Miedaner said it’s good to see people working together to support the community. “I’ve been really encouraged by seeing various organizations and groups joined together to provide for the community, and I think this partnership really demonstrates that,” Miedaner said. April 4 RAINN Day. 11:30 a.m. - 1 p.m., Reeve Concourse. Indigenous Historical Trauma. 5 - 6:30 p.m., Reeve 212. April 10 Acceptance of DrugFacilitated Sexual Assault. 12:40 - 1:40 p.m., Sage 3224. #MeToo, Now What? 7 - 8:30 p.m., Reeve 212. April 15 Exposing Human Trafficking. 12:40 1:40 p.m., Clow C240. Preventing LGBTQ+ Violence. 5:30 - 7 p.m., Reeve Union Theatre 307. Free speech for some? UWO tackles 1st Amendment students choosing their own grade at the end of the course. Thomas said he has experienced discrimination throughout his life due to his sexual orientation, which puts him in a unique position to tackle social justice issues on campus. “I know what it’s like to be oppressed, to have people hate you,” he said. “There is not anyone who is better equipped to do something about this than me.” Thomas said he is giving students a forum to spark change. “What I want to do is ignite them and empower them and then step back and help them when they ask me,” he said. Elizabeth Pletzer Samantha Fassl, asst. of the world. So, here’s a more practical solution: Try to limit the number of times you choose the knowledge on the internet over your own. For example, if you know the way somewhere, don’t doubt yourself. If you need to do simple math, use your thinking skills. The brain power we each have and its skills of adaptation cannot be beaten. Should certain speech be restricted? 9TH PLACE BEST OF SHOW AWARD Website Large School--over 10,000 students. National College Media Convention, 2016. 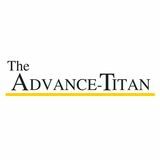 CORRECTION POLICY: The Advance-Titan is committed to correcting errors that appear on print or online. Messages can be emailed to atitan@uwosh.edu regarding corrections. dent newspaper (Region 6) Society of Professional Journalists, 2001 Member Associated Collegiate Press. POLICY The UW Oshkosh Advance-Titan is written and edited by students at UW Oshkosh who are solely responsible for its content and editorial policy. Any UW Oshkosh student is welcome to work on the newspaper staﬀ. Advertisements printed in the Advance-Titan don’t necessarily represent the opinion of the newspaper staﬀ. copy per issue. Additional copies may be purchased with prior approval from the editor for 50 cents each. 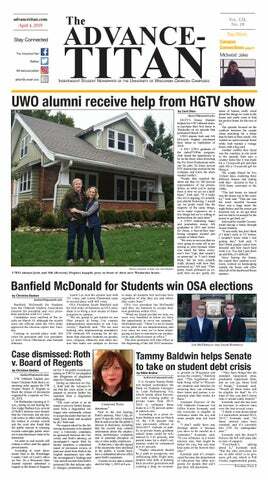 For additional copies or subscriptions, contact the Advance-Titan at 920-424-3048. Those who violate the single copy rule may be subject to prosecution for newspaper theft and ﬁned a minimum of $10,000. tans recorded nine hits as a team, leading to eight runs. Senior catcher Jensen Hinton batted in three runs on two hits. In the second game of the Saturday double header, UWO won 7-5, railing from a four-run deﬁcit. After giving up four runs in the second inning, the Titans buckled down defensively, allowing one run for the remainder of the game. UWO scored three runs in the third inning, two in the ﬁfth and one run in both the seventh and eighth innings. The team carried a balanced offensive performance with seven players recording a hit and scoring efﬁcient seven runs on 10 total hits. On March 24 the Titans wrapped up their three-game set against the Quakers with a 6-5 win in 10 innings. UWO led 5-2 entering the bottom of the ninth inning. The Quakers forced extra innings bringing in three runs. In the 10th inning, freshman catcher Kade Bohlman drove in the game-winning drive with two outs in the top of the inning to put away Earlham College, completing the sweep of the Quakers. The Titans outscored opponents 8428 over the past eight games shutting out the opponent three times. Head coach Kevin Tomasiewicz said his team has come a long way from the beginning of the season. “We knew we had talent on the team,” Tomasiewicz said. “It was going to be a lot of time before they were able to get some get experience. We have a lot of guys who have been in the program for a while now and they just need some playing time. We’ve played better every single week.” UWO will begin conference play when they travel to UW-Whitewater to play two double headers Saturday and Sunday. Game times are set for noon and 3 p.m. both days. ABOVE: Dylan Ott hits the ball versus Finlandia University. BELOW: Chris Atwood throwing a pitch versus the Lions. Ott threw the tenth no hitter in UWO history and the first since 1995. Attwood recorded 13 strikeouts on 88 pitches. ﬁeld. “Those were our ﬁrst games on dirt this season, and there is always a little learning period each year when we ﬁrst get outside,” Beyer said. “We found out the speed of the game was a little quicker than what we were ready for.” Junior Natalie Dudek said it was important for the team to pull together after dropping three out of its ﬁrst four games. “After losing a couple games in Iowa, we talked a lot about playing for each other and getting more comfortable in pressure situations,” Dudek said. “I think we made a big turn around in Florida against some good teams by doing just that.” UWO spent spring break in Florida as they went 6-2 against teams from Minnesota, New York, Maine, Illinois and Indiana. The team began the trip with a pair of victories against St. Olaf College (Minn.) and Thomas College (Maine), 6-5 and 7-0, respectively. Smaney got the win in the ﬁrst game, going six innings and giving up ﬁve runs on 10 hits. against Franklin College (Ind.) as they ultimately lost 6-2. UWO bounced back after a day off in Florida as they defeated The College of New Rochelle (N.Y.), 8-2. Sophomore Carly Szada led the Titans offensively as she recorded two hits and drove in three runs. Smaney kept the Blue Angels at bay, pitching seven innings and allowing only two runs while striking out nine. Smaney said the cohesion between herself and Menting allows for the duo to keep hitters off balance. “I’ve been working with my catcher Abby Menting to keep batters off balance,” Smaney said. “We’ve kept a good mix of pitches and were able to adapt to different teams and batters. Usually, my game plan is to just get ahead in counts and trust my defense.” The Titans then ﬁnished out the trip with a 8-0 win against Colby College (Maine) and two victories against the University of Chicago (Ill.). The Titans will host Lakeland University on Thursday in a double header with the ﬁrst game starting at 3 p.m.
Our biggest one-day sale Sat., April 13, Open 7 a.m. – 9 p.m.
Over 400 limited RSD vinyl releases Full list of releases at RecordStoreDay.com • Freebies and giveaways all day • Live music, 1-3 p.m. Oldest independent record store in the U.S.
keep pushing ourselves. When regionals came, and we placed second as a team, I think everyone was overwhelmed with the emotions and the reality that we actually accomplished and exceeded our team goals.” Jarvis said the team expects to be back at the NCGA championship next season if they keep up the hard work. “I think we all would just like to keep doing what we know how to do,” Jarvis said. “From the start of season to the end and stay on the road to nationals in Ithaca next year.” Despite not receiving all-american honors in gymnastics, Finin earned academic All-American honors for her excellence in the classroom. Finin said she is happy to receive the award and recognized the sacrifices she and others had to make in order to compete in the sport she loves. “Balancing gymnastics and nursing school has not been an easy road, but it has been extremely rewarding,” Finin said. “I have had to do a lot of adjusting to both my school and gymnastics schedules to be able to make it all work. Both my coaches and professors have been very supportive and understanding, which has helped me with my overall success.” The NCGA recognized the top eight finishers in each event as All-Americans and named UWO’s head coach Lauren Karnitz and Ithaca College’s Rachel Lee as its 2019 Coach of the Year and 2019 Senior Athlete of the Year, respectively. UWO gymnastics team will look to build on this year’s success next season. Track and field men place first and women third by Evan Moris	morise36@uwosh.edu The UW Oshkosh men’s and women’s track and field teams commenced the 2019 outdoor track season last Thursday at the Carroll University Invitational in Waukesha. The men’s team took home first place while the women’s team placed third at the event. The women’s team had six first-place finishers at the Carroll Invitational. UWO senior Lauren Wrensch took home first place in the women’s 100-meter dash with a time of 12.56 and first place in the long jump with a measurement of 19-4. Wrensch made last month’s indoor national championships in the long jump, 200-meter dash and the 400-meter run. Wrensch said the transition from indoor to outdoor brings pros and cons. “Indoor, you don’t have to deal with any weather issues, but since the track is smaller, the tight turns are harder on your body,” Wrensch said. “Outdoor wind is definitely a factor, sometimes good sometimes bad, but it’s nice because the track is larger, so it allows me to open up more in my running, which creates faster times.” Junior Taylor Pralle earned first place in the 200-meter dash with a time of 26.63 seconds. Pralle also placed third in the 100-meter dash with a time of 12.87.
finished fourth and fifth with throws of 37.80 meters and 37.66 meters, respectively. On the men’s side, the Titans had nine first-place finishers at the Carroll University Invitational, including Robert Obguli, Benny Jung, Steven Potter, Andrew Muskevitsch, Abel Christiansen, Andrew George, Joe Vils, Jonathan Wilburn and Nick Tegtmeier. Ogbuli and Jung placed first and second in the 100-meter dash and the 200-meter dash. In the 100-meter dash, Ogbuli took first while Jung placed second with times of 10.74 and 10.82. In the 200-meter dash, Jung took first as Ogbuli landed in second with times of 21.92 and 22.08, respectively. Ogbuli said his goal for the season individually is to set a personal record in the 100and 200-meter dash events. “I want to go 10.5 in the 100, qualify for nationals,” Ogbuli said. “I wasn’t able to break 11 [seconds] last year. Coming into the first meet that’s something I wanted to do. Running the 10.74 really boosted my confidence because last year I wasn’t even a top guy on the team. Being one of the top guys is really special to me. In the 200, I want to get down to a mid-21-[second] time and qualify for nationals.” Potter outpaced teammate Justin Skinkis in the 800-meter run to take first place with a time of 1:55.27. Skinkis took second at 1:55.73. Led by Muskevitsch, the Titans took three of the top four spots in the 10,000-meter run. Muskevitsch finished first at 33:20.22, freshman Noah Bruehl followed in second with a time of 34:02.74 and junior Henry Laste finished in fourth at 35:59.26. Christiansen took first in the 110-meter hurdles with 15.07 seconds. Fellow Titan Kunmi Olatunde finished in third at 16.32 seconds. George took first in the 3,000-meter steeplechase, recording a time of 9:41.94. In the men’s pole vault, UWO took the top three spots. Vils took first with a measurement of 16-00.75 meters. Junior Zach Emmer and freshman Cade Ellenbecker finished second and third with heights of 14-05.25 and 13-05.25. Wilburn continued his success from the indoor season by winning the triple jump with a measurement of 47-09.00. Teammate Jared Ollhoff finished third at 42-07.50 meters. In men’s shot put, UWO claimed the first and second spots. Tegtmeier finished first with a throw of 49-06.50 as freshman Jackson Sheckler placed second at 49-2.25. Rex Foster Twilight Invitational Place: UW-Whitewater Date: Friday, April 5 Time: 3 p.m. ABOVE: Wilke keeps a tight form before entering a his back tuck and diving motion at the NCAA Division-III Diving Championship. LEFT: Wilke eyes his landing in a full form diving motion. BELOW: Wilke concetrates as he prepares his dive attempt on the 1-meter board. Wilke finshed 13th in the 3-meter dive and 16th in the 1-meter dive. On this day in history 1865 - Wisconsin troops meet Confederate troops in Virginia. Seven Wisconsin infantry units chase General Robert E. Lee through Virginia after the fall of Richmond. The Confederate troops pulled out of the battle before it ever began. 1949 - North Atlantic Treaty Organization (NATO) is signed in Washington D.C. 1968 - Civil rights activist Martin Luther King Jr. is assassinated in Memphis,Tennessee. 1973 - World Trade Center, once the world’s tallest building, opens in New York. 1975 - Microsoft is founded as a partnership between Bill Gates and Paul Allen. 2013 - A federal judge sentences five former New Orleans police officers to prison for deadly shootings in the days following Hurricane Katrina. 2018 - Democrat Rebecca Dallet defeats Michael Screnock to win Wisconsin Supreme Court seat. Dallet was the first nonincumbent liberal to win the seat in 23 years and inspired former Gov. Scott Walker to tweet in warning of a blue wave. Upcoming events April 4 - Fascinating Facts About Birds; Artist Kim Russell will be giving a presentation of birds as seen through her eyes for “Feathered Portraits: Stylized Bird Drawings in Ink and Acrylic,” an exhibit. Gail F. Steinhilber Art Gallery, Reeve Union 6 p.m. April 4 - TransAction week keynote speaker Jac Stringer will talk about Related Histories; Commonalities between Native and Trans Activist Movements in Sage 1214 at 7 p.m. Doors open at 6:30 p.m. April 5 - Titan Nights and Rainbow Alliance for HOPE (UW Oshkosh) hold their annual drag show at Reeve Union with spotlight performer Vivian Storm; tickets are $3 for UWO students and $5 for guests — cash and Titan Dollars are accepted. Doors open at 6:15 p.m., and the show starts at 7 p.m. April 6-7 - The State Indoor Sports tournament comes to UWO for its 42nd year. There will be 15,000 athletes and coaches competing this year in basketball, gymnastics and dance. Competition takes place at Kolf Sports Center (785 High Ave) at 3:30 p.m. April 8 - UW Oshkosh LGBTQ Resource Center offers a Bi/Pan/Poly group discussion from 4:14-5:15 p.m at the Women’s Center (717 W. Irving Ave.) April 9 - Taste of Nations: Japan, presented by University Dining and the Office of International Education in Reeve Union Ballroom 227 from 11:30 a.m. to 1 p.m. April 9 - Dementia Touches Us All Workshop #1 Understanding Dementia & Alzheimer’s Disease at Culver Family Welcome Center. The workshop starts at 5:30 p.m. and ends at 8:30 p.m. Admission priced between $25 and $45. where people will record or post pictures of AirPod users in a mocking or humorous way. Apple’s in-house brand Beats comes out with their own concept of completely wireless Sport headphones in April. Users are expecting many of the same features with the Beats as the AirPod headphones. However, Beats don’t come under as much ridicule over their battery life as the AirPods do, but draw comments on social media like “I didn’t know my parents were broke until they got me Beats.” At the end of the day, wireless headphones like AirPods are the latest growing trend that, given they don’t fall off, will make wired headphones obsolete. Dreamcatchers, Wind Chimes and Bells! Your Original Source for Cool & Unique Clothes, Jewelry, World Gifts, Smoke Shop & much, much more! Downtown Oshkosh since 1969 ONLY 4 BLOCKS FROM CAMPUS!